Lead (symbol Pb, atomic number 82) is a soft, dense, bluish-gray metal that melts at the relatively low temperature of 328°C (662°F). It has many beneficial uses in compounds as well as in its metallic form, but is toxic at almost any level in the body. Mentioned in the Bible, lead was one of the first known metals. Its toxicity was also recognized long ago; Greek physicians made the first clinical description of lead poisoning in the first century B . C . E ., and lead is arguably the earliest known industrial pollutant. Lead taken internally in any of its forms is highly toxic. At higher body levels, the symptoms of lead poisoning are anemia, weakness, constipation, colic, palsy, and often a paralysis of the wrists and ankles. At low levels, there may be no symptoms. Young children are especially at risk from lead, even at levels once thought safe. Low-level lead poisoning can reduce intelligence, delay motor development, impair memory, and cause hearing problems and troubles in balance. Higher levels of lead poisoning are reduced with the use of chelating agents that help the body to excrete the lead in urine. Although this may address the physical symptoms mentioned above, there is no cure for the loss of IQ and other neurological effects that lead poisoning has on young children. Lead was used by the Romans to make water pipes and create elaborate urban water systems. The word plumbing comes from the Latin word for lead, plumbum. Lead was, and still remains, a natural choice for plumbing, Widely available, it is durable and easily malleable , and it does not rust. Water is still delivered to homes in many U.S. cities via lead supply pipes. Alloys of lead are also used in solder and in brass faucets and fixtures. Drinking water can leach lead out of a plumbing system, and this may be one source of lead exposure. The most common uses of lead today are in lead-acid storage batteries and to shield against radiation. Computer screens are made of leaded glass to contain the electromagnetic radiation within, and as a consequence, two U.S. states have banned the disposal of CRT monitors in landfills and incinerators. Lead is useful in many compounds. Lead carbonate, called white lead, has been used for over 2,000 years as a white pigment in paint and ceramic glazes, and other lead compounds have been used as pigments and driers . Lead-based paint was first identified as the source of deadly childhood poisoning in Australia in 1904. Subsequently, lead-based paint was banned in Australia and much of Europe in the 1920s, but the United States did not prohibit its residential use for another fifty years. By 1971 it was determined that two hundred children a year died annually in this country as a result of lead poisoning. That year Congress passed the Lead-Based Poisoning Prevention Act, but delayed implementation of its official ban until 1977. The lead-based paint applied to homes during the first two-thirds of the twentieth century continues to be the primary cause of childhood lead poisoning. 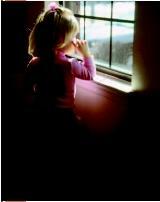 Children who eat flakes of peeling and chipping paint in older, unmaintained housing are at serious risk. The National Survey of Lead and Allergens in Housing for 1998 to 2000 found that some 38 million housing units contain lead-based paint. Some 25 million of these units have "significant" lead-based paint hazards. Even lead-based paint that is in good condition can pose a risk as the dust created by the friction of opening and closing windows may cause low-level lead poisoning. The renovation of an older home, when done improperly, can poison adults and children as well as pets living in that residence. Residential lead-based paint should never be sanded or burned off. Lead poisoning is an important health problem, affecting an estimated 890,000 preschoolers, according to the U.S. Centers for Disease Control and Prevention. That means that about 4.4 percent of children aged one to five have unacceptably high levels of lead in their bodies. Although lead poisoning crosses all socioeconomic, geographic, and racial boundaries, the burden of this disease falls disproportionately on low-income families and those of color. In the United States, children from poor families are eight times more likely to be poisoned by lead than those from higher-income families. ©2003, Robert J. Huffman, Field Mark Publications. Reproduced by permission. engines. The lead survived the combustion process and became a significant contributor to air pollution. Leaded gasoline was phased out in the United States starting in 1976. All gasoline-powered cars and trucks now sold in this country must burn unleaded gasoline. Leaded gasoline nevertheless remains a problem in many other countries. In 1995 fewer than thirty countries worldwide had banned leaded gasoline. In 1996 the World Bank called for the international phasing out of leaded gasoline, claiming that most of the 1.7 billion urban dwellers in developing countries were at risk from lead poisoning. The United Nations Commission on Human Settlements—known as Habitat—approved a resolution in 1999 that committed member nations to begin phasing out leaded gas. By 2001 forty-five nations worldwide had banned its use. Lead used in gasoline vs. Average blood lead. smelter contained extremely high concentrations of lead (up to 300,000 parts per million), and the site has been declared an urgent public health hazard. Enforcement actions by the U.S. Environmental Protection Agency (EPA) and the Missouri Department of Natural Resources led to an agreement by the Doe Run Company, the smelter's owner, to install new controls on air emissions, remediate lead contamination in residential yards, and stabilize a contaminated slag pile located in the Mississippi River flood plain. Although lead is a persistent and widespread contaminant in both natural and man-made environments, lead poisoning is an entirely preventable disease. The key to prevention is the elimination of sources and pathways . 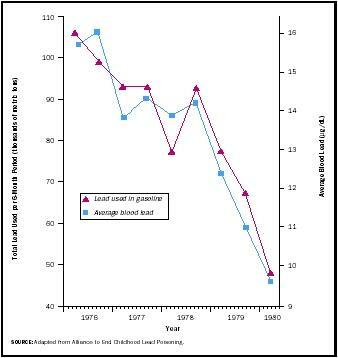 The positive results of bans on leaded gasoline, lead in paints and glazes, lead solder, and lead plumbing can be seen in the reduction in the number of lead-poisoning cases as well as the decreased levels of lead found in the general population. Stapleton, Richard. (1994). Lead Is a Silent Hazard. New York: Walker and Company. Warren, Christian. (2001). 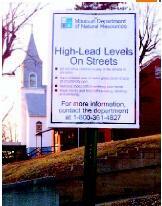 Brush with Death; A Social History of Lead Poisoning. Baltimore: Johns Hopkins University Press, 2001. Alliance to End Childhood Lead Poisoning. Available at http://www.aeclp.org . CDC Childhood Lead Poisoning Prevention Program. Available at http://www.cdc. gov/nceh/lead/lead.htm . This is an important subject – not just for travelers but for local populations, especially children, who suffer the most from lack of facilities, plumbing and sanitation. I admire companies who help to install facilities in other countries. See below, Toilets = Luxury, from Sacramento News and Review, Reno News and Review, Chico News and Review, January 13, 2011. This article was published on 01.13.11. Kimberly A. Edwards is an employee for the California Department of Education and a freelance writer of 30 years who serves on the board of the California Writers Club Sacramento branch. When Lewis Mumford in 1938 wrote, “The only place sacred from interruption is the private toilet,” he underestimated such a privilege. As it turns out, restrooms comprise a comfort yet to be fully enjoyed worldwide. The Associated Press reported recently that only a bit more than 50 percent of India’s population shares this convenience. In our cozy American homes, it’s difficult to fathom that a quarter of the Earth’s people has never used a restroom. In some countries, schools offer no facilities. On some train lavatories, it’s clear when you peer down the hole and see the rails moving just how realities differ across our globe. Exactly what is “taken for granted” was illustrated by a trip Frank and I took in Peru’s central Andes. With the journey scheduled to last eight hours, our agent assured us that the double-decker bus boasted a bathroom. Yet when passengers settled into their upper-level seats, I found the lavatory locked. After the first stop, I checked again. Chains still blocked entry. As the vehicle took off, I wondered how to communicate with the driver, insulated in the cab below. Frank promised to remind him at the next stop. When the bus pulled over. Frank descended. When the bus took off, the bathroom remained barred. “The driver probably has to clean it himself,” speculated Frank. As I rocked from side to side, I recalled the previous week, when in the Sacred Valley a boy led me through a bar, past a tethered bull, to a wooden frame sheltering a hole in the ground. In Lima, a man at a table outside a public restroom collected entry fees. He quizzed Frank on which “call of nature” to determine how many squares of tissue to dole out. At the next stop, Frank joined other male travelers pounding the driver’s cabin. “Open the bathroom door,” they demanded. In summary, the next time you enter a restroom, appreciate the indulgence and envision the circumstances faced by millions who lack the luxury Mumford knew in 1938.